Copyright © 2019 Jim Condron. Jim Condron gives this sculptural installation a mouthful of a name—”It opened with the melancholy reflection that, in the lives of mortals, the best days are the first to flee”—and every one of the 25 mixed-media works included in his Diminishing Returns solo exhibition have such verbally overstuffed titles. In another campus gallery, the geometric paintings in Timothy J. Horjus’ Subverted Sublime solo show also feature idiosyncratic titles, such as “Want someone else to deliver the goods” and “So perf, so PINK.,” that read like the fragmentary thoughts of an email subject line or internet meme. Both Baltimore-based artists are exploring some sense of what abstraction looks like in the 21st-century. And they’re both navigating, in their own vocabularies, that tense chasm where contemporrary daily life transpires, sandwiched between the seemingly endless technological abundance and the blunt want of economic austerity. Horjus’ paintings are the more inscrutable at first glance. He works mostly large in these paintings, his canvases ranging from 36-inch squares to a wall-devouring 60-by-72-inch vertical rectangle. Horjus also uses house paint with a matte finish as his medium, so even his warmer colors are more flat than bright. The most immediately defining characteristic of his work, however, is the use of skewed grids, like a sheet of graph paper torqued in such a way to send formerly perpendicular and parallel lines retreating toward vanishing points somewhere far off the canvas. Every canvas includes some snippet of this oblique grid skeleton, which makes describing them a bit awkward. Interspersed among the lines are various polygons of color, like building outlines plopped onto an aerial view of a city map. Compositionally, Horjus’ paintings can look equal parts Mondrian modernism and Tron‘s 1980s virtual reality, but his embrace of negative space lends his canvases a curious eeriness. Consider “become number one in dating,” that mammoth 60-by-72-inch painting. A trio of thin, battleship gray lines run vertically at a slight right to left diagonal, with a thicker fourth gray line almost bisecting the composition. Four other thick lines, painted with the same matte gray across the canvas horizontally, three running diagonally up and to the right, one diagonally down and to the right. A soft blueish gray and dull purple shadows some of these lines, lending a sense of depth to their thickness. A series of beige and taupe triangles, pentagons, and hexagons dance across the middle of the composition, sometimes laid atop the lines, sometimes appearing to lay beneath the lines. This verbal description suggests a dense, complex composition, but standing before the canvas it’s easy to feel overpowered by the negative space of its sandy background color. Where a composer like John Cage used silence to focus the ear on the ambient music of the natural world that he didn’t write, Horjus uses negative space to highlight the emptiness of the designs he makes on his canvases. The neutral hues of his canvases’s background colors become hypnotic voids, and his paintings’ superficial sameness accrues a disarming power when taking in so many of his works at once. And Horjus toys with his disarming repetitiveness by hanging pairs of smaller canvases that look like mirror images of each other together. “Check out your possible matches now!’ differs from its wall mate “Make Christmas Magical again!” only in its color scheme. The brick-red lines and maroon, pink, rose shapes of “Make Christmas” are the mirror image of the steel-blue lines and aqua, teal, and moss green shapes of “Possible Matches,” and the visual similarity doesn’t account for why their titles differ only in their banality. Horjus injects a bit satire into his work in this disarming way: Strolling through Subverted Sublime is like opening up an overstuffed email spam folder, filled with uninvited advertising, phishing schemes, installments of long forgotten newsletters, endless requests for political contributions, tawdry online dating sites—a barrage of information turned into a muted torrent of noise. Where Horjus mines the emptiness of information overload, Condron dives headfirst into the poverty of abundance. Looking over the materials that meet up his mixed-media works here reads like a list of items scrounged during a night of dumpster diving: felt, foam, fur, leather, silk, paper, wax, wool, vintage tractor parts, vintage plow, and vinyl, in addition to acrylic, latex, spray, and oil paints. Visually, Condron’s mixed-media installations and paintings recall Robert Rauschenberg Combines and arte povera’s radical simplicity, but he’s turned the assemblage’s collage power into a political hammer. Reading the paintings in descending order of size almost feels like reading pages ripped out of some postmodern comic artist’s graphic novel about a homesteader’s journal, each linen canvas a blurry, smudged illustration of the title’s text. “I had the sense of coming home to myself” is a smudge of blue oil marred by splotches of white; dense layers of black obscure whatever else may be contained in “They were big and warm,” a few streaks of coral red sneaking out form the black smudge the only hints that something else may be obscured. Condron’s paintings are not expressive, gestural abstractions; they’re the visual manifestations of the messy, chaotic effects of wear and tear on the things made by human enterprise, reminders that time eventually erases all things. And sometimes, man even helps that erasure along a bit. One small oil-and-plaster-on-linen painting, placed high up on the wall, is titled “There was nothing but land: not a country at all but the material out of which countries are made.” It’s a lined cribbed from Willa Cather’s 1918 novel My Ántonia—many, if not all, of the titles appear to be Cather quotes—which tells the story of an immigrant worker in late 19th-century Nebraska. It’s a novel about the lower-class hardships of the American West, and Condron’s works here offer a sobering reminder of how quickly working people’s fortunes can turn. He’s using old farm implements for a reason. The rusty plows, tillers, and tractors of mechanized farming that Condron uses here were still a ways off from the era Cather covers a century back in My Antonia, but those implements might as well be from the bronze age to us 21st-century consumers fed by a global industrial food industry. And how Condron treats them makes them look even more obsolete. 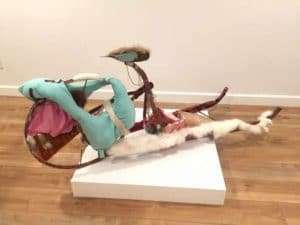 A vintage plow’s blade and wheel are draped in white fur, pink and teal felt, and wool yarn, and plastic in “Mental excitement was apt to send me with a rush back to my own naked land and the figures scattered upon it,” making this outmoded tool almost comically pointless. People once used something like this to feed themselves? Of course, everything old was once state of the art, and it’s one of human intelligence’s grand jokes to assume that the time in which we live is so advanced and modern compared to the past. Diminishing Returns, Condron’s exhibition title, is the economic theory that says that additions to the production process of a product will, eventually, lead to lower returns on that product. Speaking reductively, in labor force terms, it means that if the technology stays the same, hiring more workers eventually leads to lower output and, as a result, lower profits and earnings. The bulk of today’s labor force may primarily be found in the information and service industries, but the law of diminishing marginal returns suggests that at some point, the more workers that enter such economies, the less they’ll produce and make. What will people do to survive then? 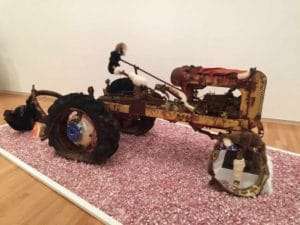 That tractor that dominates the gallery isn’t going to help produced anything that people can consume. And, understood within the cruel economic logic that Condron explores in his works, its title now sounds like an alarm: It opened with the melancholy reflection that, in the lives of mortals, the best days are the first to flee. Condron’s Diminishing Returns work, in materials and perspective, comes from the perspective of people living far downstream from which prosperity ostensibly trickles down. So go ahead. Eat the candy. Who knows where the next meal may be coming from?